Richmond Station has been a hot spot for quite some time now. Using fresh, seasonal ingredients, this eatery even acts as a butcher, cutting their own meat. Top Chef Canada winner, Carl Heinrich and his former Marben co-worker, Ryan Donovan are the pair behind Richmond Station. The restaurant has a subway theme, decorated with white subway tiled walls covered in old pictures of Toronto subway construction. We were seated at the chef’s table, which overlooks the kitchen. It was such a cool experience to watch what goes on in a busy, yet totally organized kitchen. The Stn. 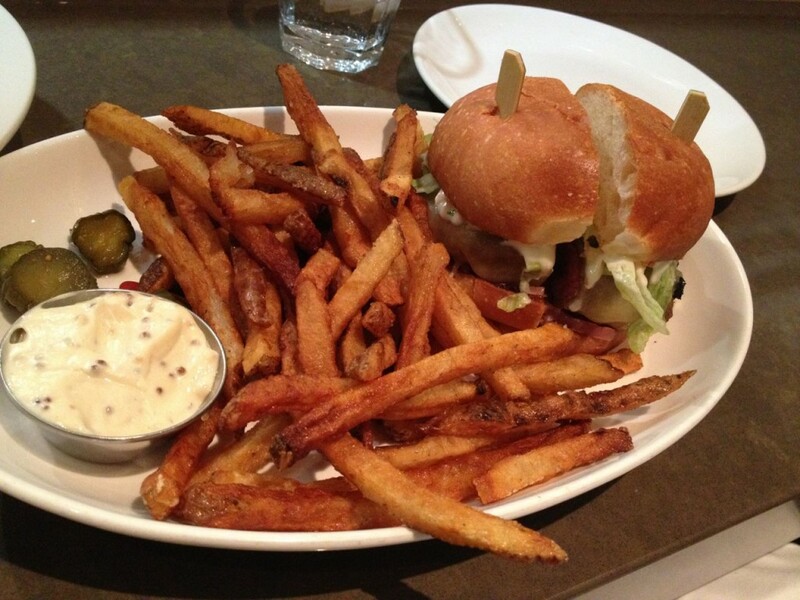 Burger has graced many “Toronto’s Best Burger” lists since opening. The medium-rare patty is composed of ground beef, with a braised beef center. This creates for a overwhelmingly juicy and flavourful burger, topped with sweet beet chutney, aged cheddar, bread and butter pickles, served on a soft milk bun. The rosemary fries were also a delicious addition. The second dish was the braised beef ravioli. 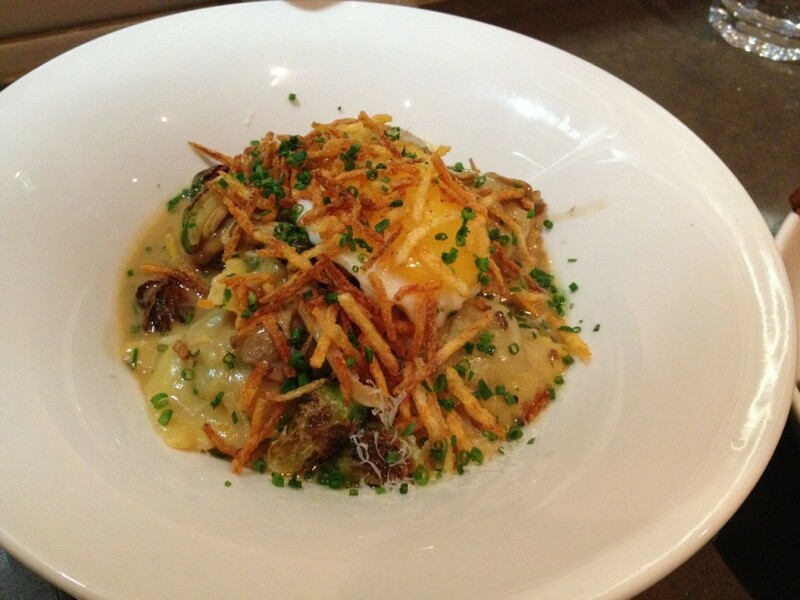 It was topped with crispy Brussels sprouts, a fried egg, grated toscano cheese (pecorino), and hickory sticks. The soft, juicy meat, combined with a soft boiled egg and the crunchy hickory sticks made for a tasty, yet rich dish, but perfect for sharing. This flavourful dish was intense, yet truly enjoyable. Look no further for the easiest, most crowd pleasing recipe. Monkey bread is basically a pull-apart bread, and can be made sweet or savoury. I decided to try out both options. The final result not only looks beautiful and complex, but it tastes AMAAAZING. Your guests will assume you worked really hard on this dish, but it’ll be our little secret just how easy it actually is. Another secret I’ll share with you is that the recipe uses Pillsbury dough. You can make this recipe from scratch but that requires more time and energy, and frankly, who has that these days?! 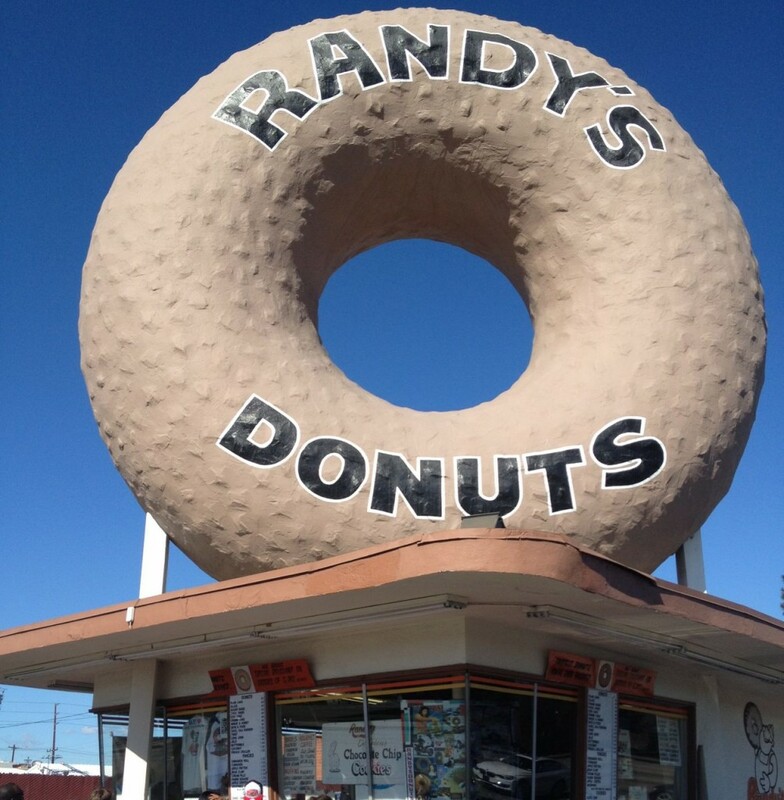 Let’s get back to LA talk, starting with Randy’s Donuts. OMG. OMG. OMG. That is all. I also posted about Randy’s in my LA post from over a year ago. However, no trip to LA is complete without multiple stops here. I won’t even tell you how many times I visited. This 24 hour walk-up window and drive-thru donut shop is the real deal. 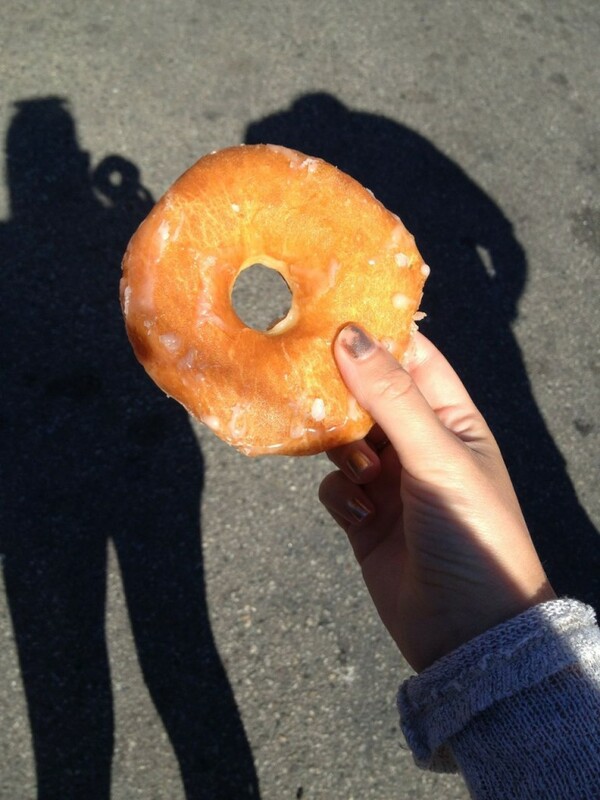 They specialize in simple, old school donuts. Nothing fancy here. Plain glazed, chocolate glazed, cream filled, all that sort of simple stuff. It is kind of unexplainable how good they are. Once again, simplicity is key. Fried chicken is up next, with a stop at Honey’s Kettle Fried Chicken. It does not get more Southern comfort food than this. My order of fried chicken and biscuits was rich and heavy, but more than worth the splurge. 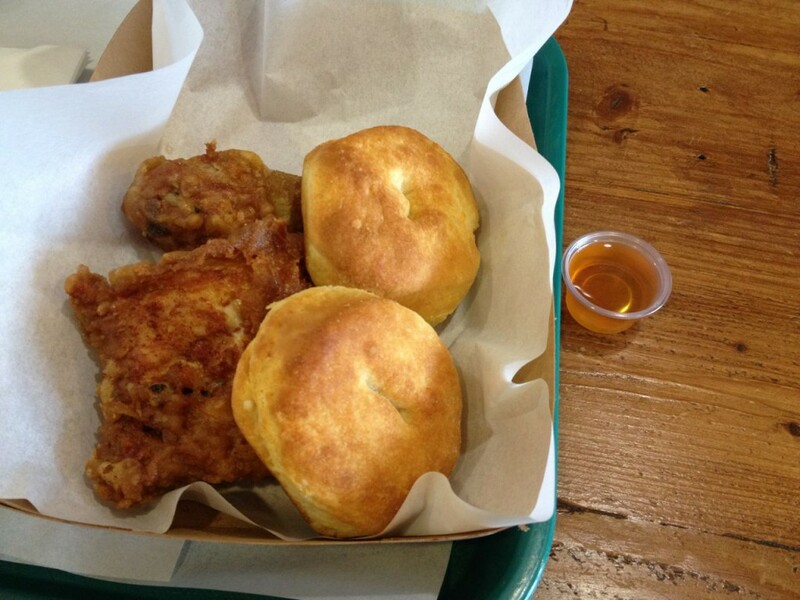 The chicken was crispy and juicy, and the biscuits, OMG, don’t even get me started. Buttery and flakey. The most perfect biscuit I have ever tasted. I dream about these. Hey everyone! It’s me, I’m back. You may have noticed that I took a little hiatus. Not from eating, but from sharing it with all of you. Not to worry though, I am back. Here’s the answer as to where I disappeared to. You know, life got busy, life got in the way, and then I took an extended vacay to my favourite place of all time, Los Angeles. I was just feeling blah and needed a change. What better way to liven up a little than to spend six weeks in the sun? A lovely time was had, full of eating, sightseeing, shopping, beaching, working out, and just living. I suppose you can call a lot of what I was doing work, since I ate at some of the coolest most delicious places which I am about to share. Let’s get right to it. I’ll start with a restaurant called Father’s Office in Santa Monica. Former Top Chef Masters contestant Chef Sang Yoon is responsible for the food here. The concept is pretty cool. Think bar meets restaurant, but you have to be 21+ at all times. It’s not some grungy bar serving cold deep fried everything with a side of stale nachos. You order your food at the bar, then just have to stand around drinking while waiting for a table. It was very loud, busy, and filled with young, hip people. No substitutions or changes to the menu. The Office Burger is the star of the show here. Firstly, the medium rare beef patty is served on a baguette, and topped with a mixture of bacon, blue cheese, and caramelized onions then sprinkled with arugula and gruyere cheese. The bun was fresh, the meat was juicy, and the toppings paired extremely well. 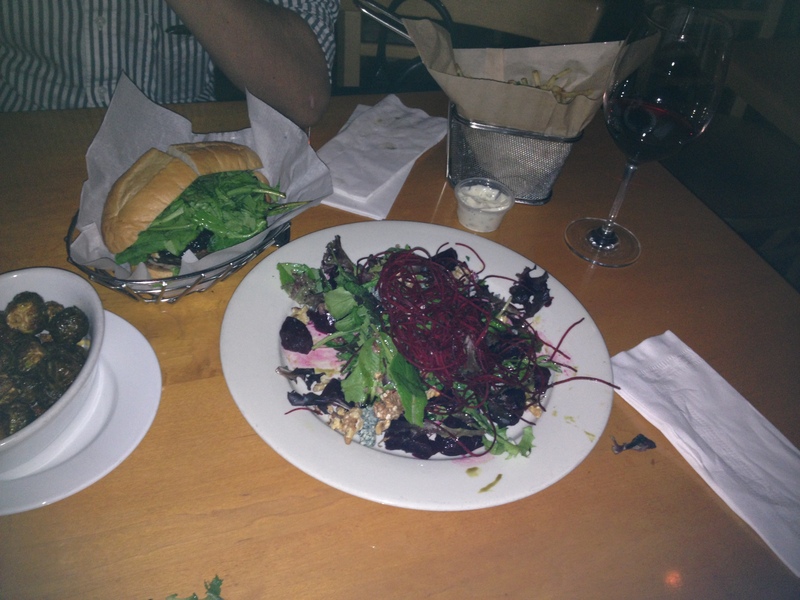 I thoroughly enjoyed this burger with a side of thin cut fries, crispy brussels sprouts and a green salad. I have been wanting to visit Museum Tavern for quite a while, so I was glad that my boyfriend finally made a reservation. It seemed so intriguing being located across from the ROM on an upper level overlooking Bloor St.
At first glance of the menu, I wanted everything. I decided to start off with one of their cocktails, which also all looked amazing. I chose “The Garden of Eden” consisting of Bombay Sapphire gin, Segura Viudas cava, cucumber, mint, lime, simple syrup. It was perfectly refreshing. 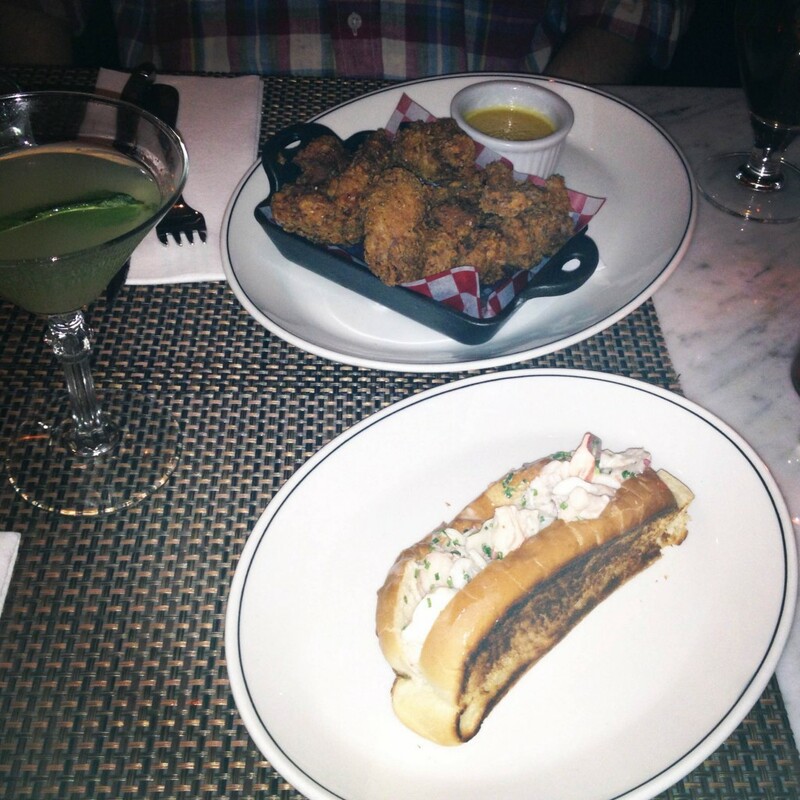 As for starters, my boyfriend and I ordered the lobster roll, which was served on a toasted buttery bun, tossed in lemon mayo and sprinkled with chives. It was simple, fresh, and incredibly tasty, just as lobster rolls should be. Our next dish was the Buttermilk Fried Chicken which was brined for 24 hours. The crispy, juicy chicken paired well with the maple mustard dipping sauce. 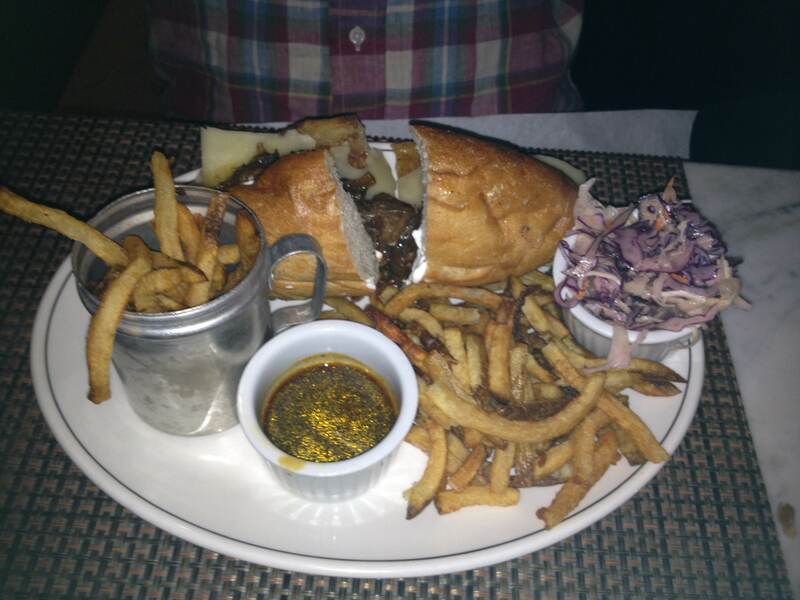 Our next dish that we also shared was the French Onion Short Rib dip, one of their best sellers. It was topped with emmental cheese, caramelized onions, sour cream, brandied broth, served along side thin, crispy fries and coleslaw. This dish was utterly incredible, but extremely rich. I would definitely recommend ordering this dish, but sharing it as we did. If you would like to visit Museum Tavern it is probably best to make a reservation, as it was comfortably busy, but not lined up. The décor is very “New York tavern” and seemed elegant, yet classic at the same time. If I told you there was a guilt free way to indulge in pizza, would you believe me? It might sound crazy what I am about to tell you, but trust me on this one. Cauliflower, as well as gluten-free eating is having its 15 minutes of fame at the moment and being thrown into just about anything. A carb-less pizza also sounds pretty crazy, but guess what? Totally possible! Pizza crust made out of cauliflower is the star of today’s recipe. It might seem odd to imagine how such a mushy, never mind vegetable, can replace that doughy, carby pizza dough. After trying this recipe, you will be hooked! Once the cauliflower dough crisps up in the oven and is covered with sauce, cheese and your favourite toppings, you would never believe what it was made of. Check out the recipe below if you want to try something new, healthy, and super delicious! Toppings-use whatever you would like! 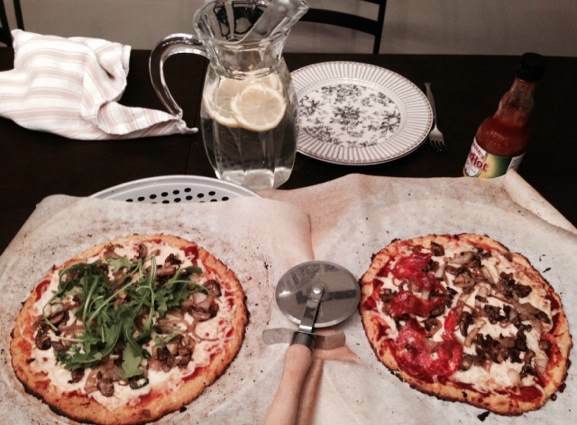 I made 2 pizzas and used tomato sauce, mozzarella cheese, mushrooms, onions, arugula. The other had all of the same, plus salami on half. Rinse cauliflower and remove stems and leaves. Toss florets into food processor and pulse until it forms a grainy, almost powder-like “snow”. Place “snow” into microwave safe bowl and microwave for 5 minutes, or until soft. Pour cauliflower onto a clean small towel and allow to cool for a few minutes. Once cooled, wrap towel around cauliflower and wring out as much liquid as possible, squeezing pretty tight. 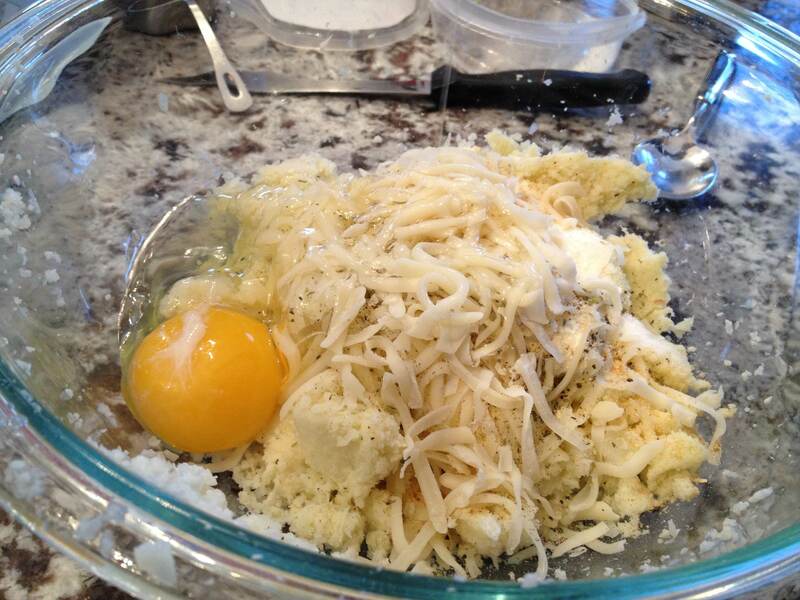 Pour cauliflower into bowl, and add in the rest of the ingredients (mozzarella, garlic powder, oregano, salt, egg). Mix together. Prepare either a baking sheet with parchment paper or a pizza stone. 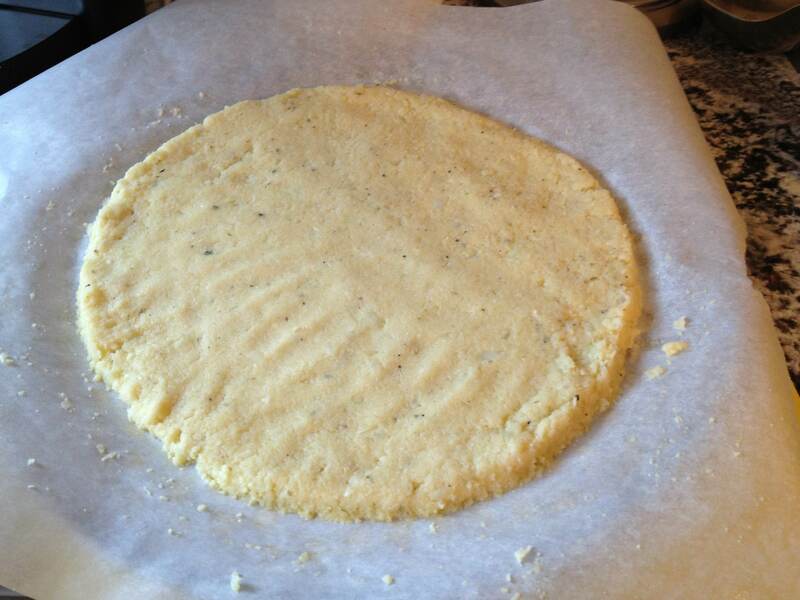 Place dough mixture on baking sheet or pizza stone and form into a circle (crust) using your hands. Bake crust at 450 degrees for about 10 minutes, or until browned and crispy (or however you like your crust). Remove crust from oven, top with sauce, cheese and toppings. Place back in oven for about 5-7 minutes, until cheese is melted to how you like it. Remove from oven, let cool for a minute, slice as you would a regular pizza, and enjoy! “Indulge” in this gluten-free, super tasty pizza without any guilt! If you’re every looking for a crowd pleaser, but not looking to spend hours in the kitchen, I suggest whipping up a trifle. Trifle’s are extremely versatile and can be made out of pretty much anything such as chocolate, berries, various fruits, as well as many other sweet treats. They are basically layers of any kind of cream, custard, or pudding combined with either fruit, or cookies for the most part. I have a huuuuge soft spot for Oreo cookies and love to incorporate them whenever I can. 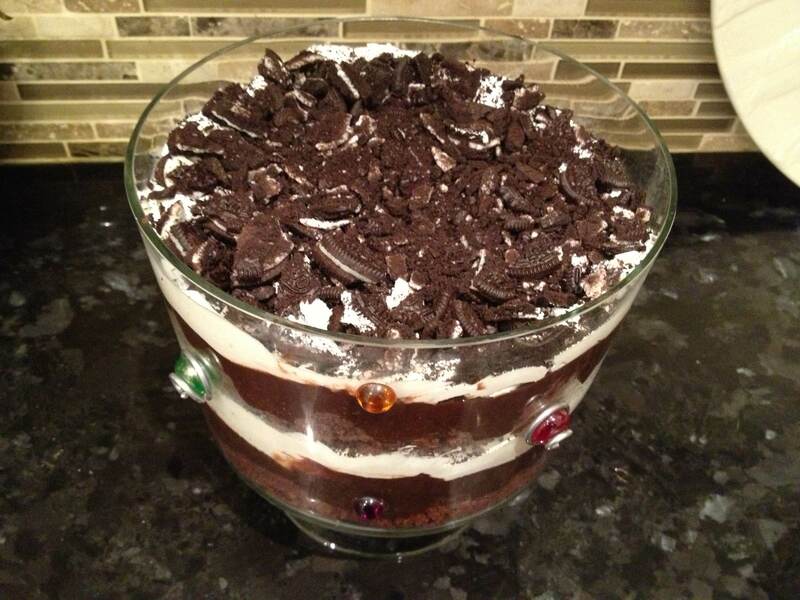 This Oreo trifle, which has been a favourite of mine when my cousin makes it is simple, yet insanely delicious. 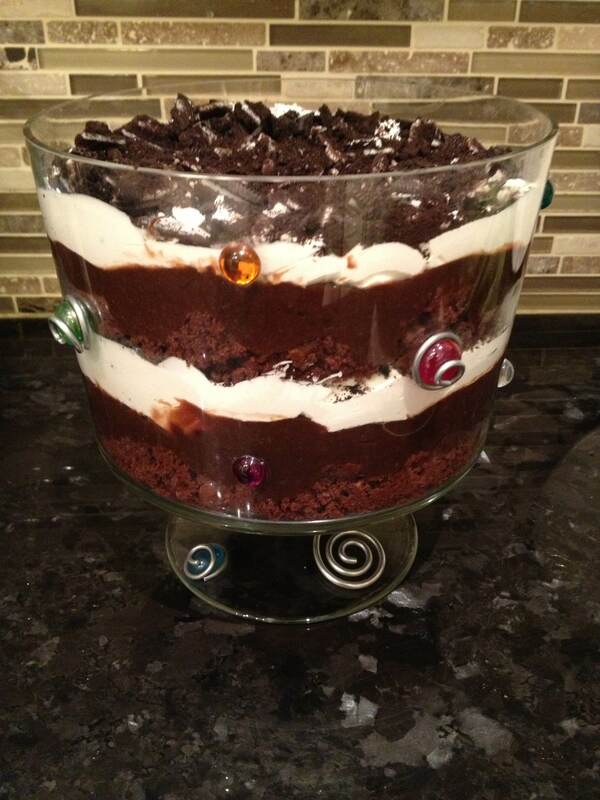 It consists of layers of chocolate cake, chocolate pudding, cool whip, and chopped Oreos. See below for the recipe, which can be altered depending on preference, and the size of your bowl. You really can’t go wrong with a trifle, so have fun with it and get creative! 1. Bake cake according to package instructions, and crumble into bite size pieces. 3. Crush Oreo’s by placing them in a zip top bag and bang them with a rolling pin, or anything hard. 4. Begin layering in trifle dish or any bowl. You can layer however you would like but my order was crumbled cake, then pudding on top, then a layer of cool whip, then sprinkled generously with crushed Oreos. Continue until you reach the top of the bowl. 5. Spoon out this yummy goodness and enjoy! If you didn’t know already, I LOVE DULCE DE LECHE!! Literally anything dulce de leche I will inhale. For those of you not aware, dulce de leche is a South American caramel, which can easily be made by heating sweetened condensed milk. 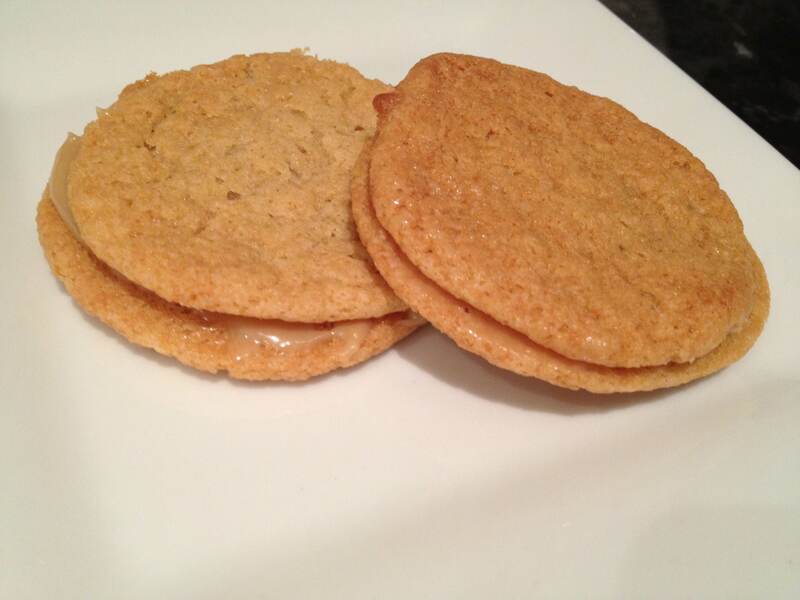 I have been wanting to make my own dulce de leche and incorporate it into a recipe for a while now, so when I came across these Dulce de Leche Sandwich cookies by Joy the Baker, I was instantly sold. It was perfect timing, considering I have a cookie exchange at work today. As the temperature drops, my cravings for warm food rises. I find it so crucial during this freezing weather to eat something comforting, yet healthy. I came up with the idea of combining two super foods that I happen to love; kale and sweet potato. This soup recipe is pretty simple and consists of hearty ingredients. Feel free to play around with my recipe and add in what you love, for example noodles, quinoa, or any veggies you have on hand. 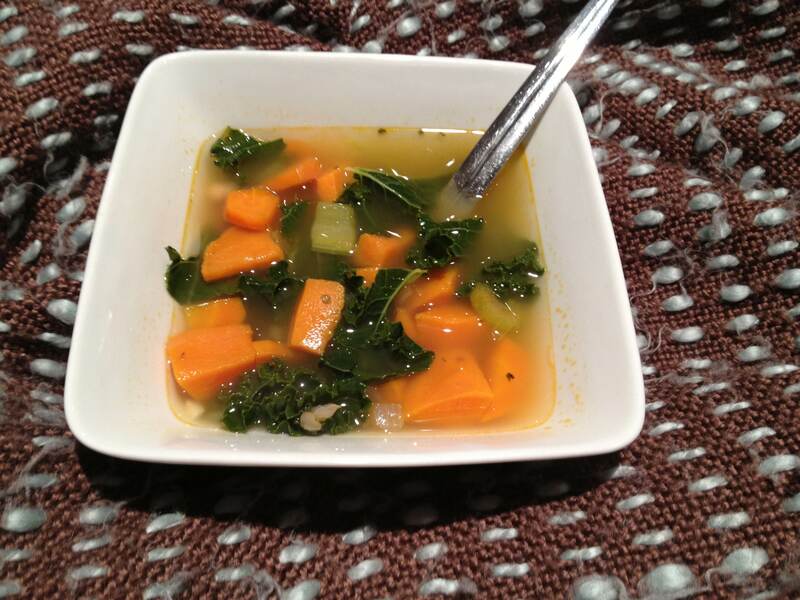 Check out the recipe below to help warm up over these cold winter months, while still fitting into your skinny jeans. 1. Pour olive oil into large pot over medium-high heat. 2. Add garlic and onions, stir to soften, about 2 minutes. 3. Add carrots and celery to garlic and onions, stir to soften, about 5-10 minutes. 4. Pour vegetable broth into pot and bring to a boil. 5. Once boiled, add sweet potato and reduce heat to a simmer. 6. 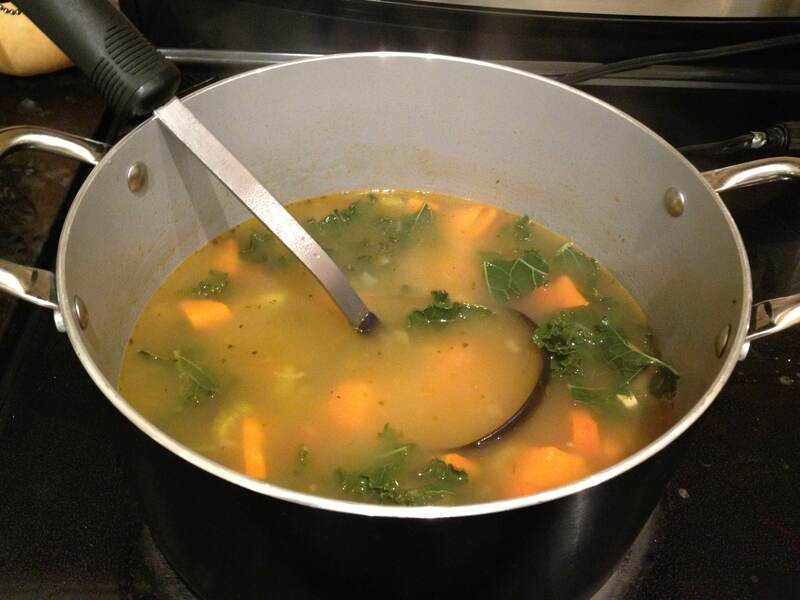 After about 5 minutes and sweet potatoes have softened, add kale and allow to cook for another 5-10 minutes. 7. Pour into bowls and enjoy! It’s crazy to think how quickly the summer flew by, and even how time has continued to fly by since. I can’t believe it’s almost the holidays already! Appologies for the delay on this post. However, better late than never! 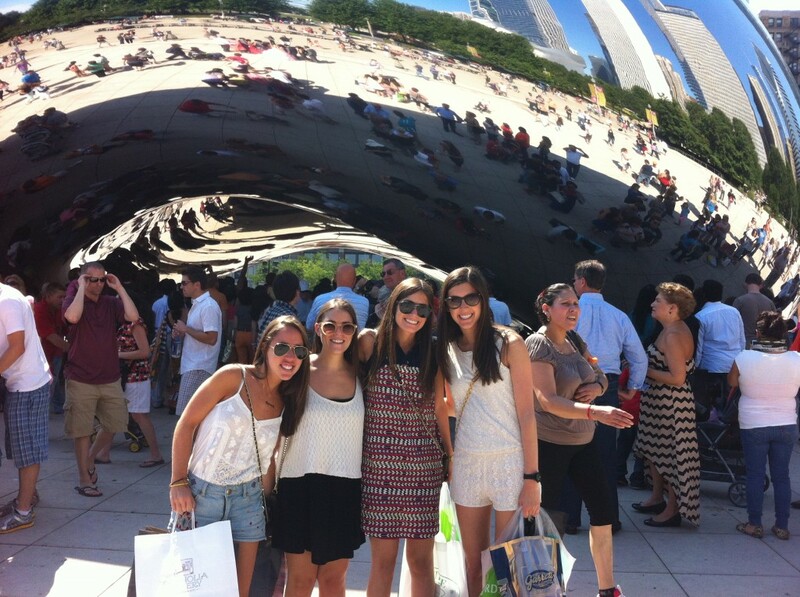 Anyways, my girlfriends and I decided to take a little girls weekend in Chicago for some shopping, eating, and sightseeing. I must say, I was blown away by this city. The shopping is unreal, the architecture and buildings are beautiful, with such intricate detail, and the city seemed very clean and proper. I loved everything about it. Between shopping and taking the architectural boat tour, there was still plenty of time left for eating. Check out below for some must-visit Chicago eateries. After settling in from the airport, we headed to a place called Big Star. It is a Mexican eatery, with a huge outdoor patio, and a bustling, loud, exciting vibe on the inside. For those of you that know of Grand Electric here in Toronto, the guy who started it actually did his apprenticeship at Big Star. While we waited for a table outside, we grabbed a drink at the busy indoor bar. Once seated with our pitcher of margarita, we ordered chips and guacamole to start. It was perfect. Next it was time for tacos. We chose a whole bunch including the chicken, braised pork belly, fish, and potato. 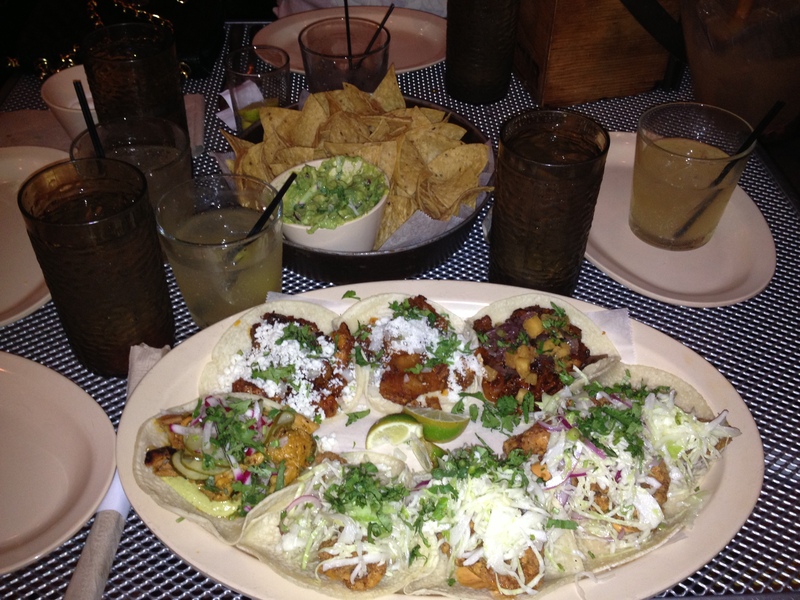 Each one was better than the next, including fresh ingredients between soft taco shells. As soon as I saw the word dulce de leche on the menu, I was sold. Dulce de leche is basically a South American caramel, and MY FAVOURITE THING EVER! 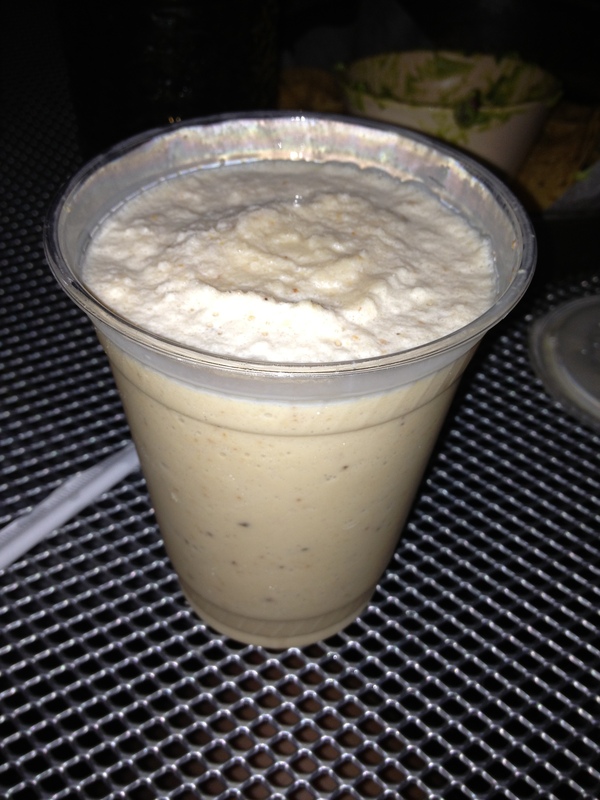 The dulce de leche milkshake at Big Star was thick, creamy, caramelly, and insanely delicious.